A soldier on guard duty at Deepcut has told an inquest how a teenage recruit went on "a quick patrol" before five shots were fired and he never returned. Fay Mulraine, now a sergeant, was a private on duty with Pte Geoff Gray overnight on 16 and 17 September 2001, the night he died at the Surrey base. She told Woking Coroner's Court she heard automatic rifle fire and believes there were five shots in total. Pte Gray was found dead with two gunshot wounds to the head. 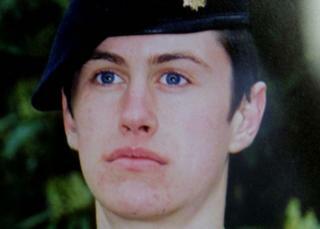 He was one of four young soldiers who died from gunshot wounds at the barracks between 1995 and 2002. Sgt Mulraine told the inquest she had been on guard duty with Pte Gray and Pte Epi Naiova. The inquest last week heard how the three soldiers faced an incident where civilian officer Billy Murphy was denied entry to the barracks where he lived after he arrived at the gates drunk. Sgt Mulraine said of Mr Murphy: "He wasn't happy. He was swearing at us. He was calling us names. We were trying to be professional." Bridget Dolan, counsel for the coroner, asked her if Pte Gray, originally from Seaham in County Durham, had remained polite and professional throughout and had not appeared upset. Sgt Mulraine said he had. Later, she joined Pte Gray on a second stint of guard duty, but he went off for a quick patrol on his own, she said. "It wasn't long after he left. A little while after, shots were fired. I knew the direction it came from. I knew that something had gone wrong," she said. Sgt Mulraine told the inquest there were "several searches" of the base for the missing Pte Gray without anyone seeing anything. Asked how many shots she heard when the automatic rifle fire sounded, she said: "There were five in total." John Cooper QC, for the family, asked Sgt Mulraine about the sound of the shots. Sgt Mulraine said: "It was bang bang, then it went to automatic." Nicholas Moss, for the Ministry of Defence, asked Sgt Mulraine about a statement she had given just after Pte Gray's death, in which she described "a single shot followed by automatic fire" and a total of four rounds being fired. Sgt Mulraine agreed with Mr Moss's suggestion that "by 2005 some things were getting jumbled" because of the trauma. The inquest, which is set to continue until May, continues.